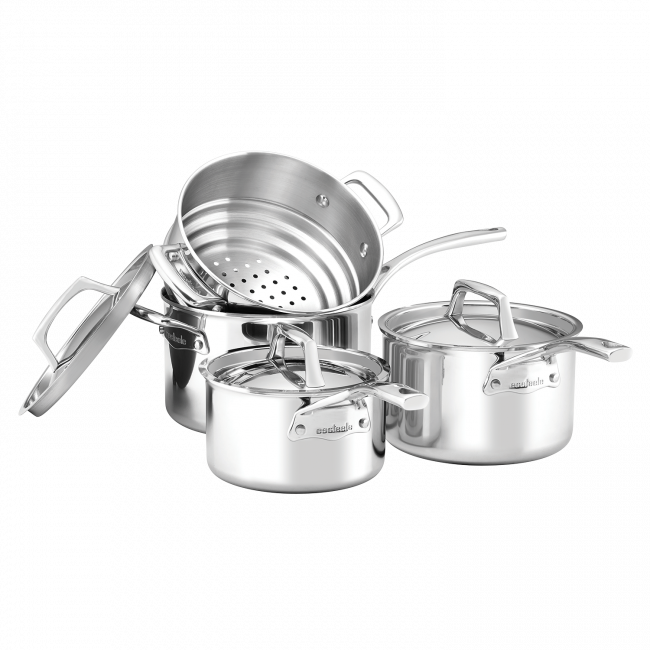 The Essteele Per Sempre 4 piece set combines premium quality materials with world renowned Italian engineering to create beautiful, chef-choice cookware. The thick, fast-heating core allows the pan to heat the base and all the way up the sides simultaneously, giving this cookware perfect heat control and optimum performance. This brilliant set contains three generously sized saucepan, and a universal multi- fit steamer for ultimate durability. Essteele Per Sempre 4 Piece Cookware Set is rated 5.0 out of 5 by 8. Rated 5 out of 5 by Shayne from Aluminium Core amazing!! I purchased this set for a family member last Christmas and have cooked on it myself at their house. WOW how amazing is the even heating all the way around the pan. Rated 5 out of 5 by Lambr from Cooks like a dream. Got this as a gift for my sister who said ‘ Love the streamlined look and design. Steamer (4 piece set) fits on all saucepans. Cooks like a dream as the way it’s made means it heats quickly and evenly on base and sides. Good build quality as you would expect from a premium brand’. Rated 5 out of 5 by Neeru from Fantastic I bought these about 15 years ago, use it every day and looks new as. Never had any issues. Bought bigger pots separately as well, great investment. Rated 5 out of 5 by sezzzz from Amazing quality The pans are slightly heavy but feel really good quality and are very well made. I love how the steamer fits all of the 3 sizes of saucepans. Great value for money as I bought in the half price sale but worth the money full price as well. Rated 5 out of 5 by annazianna from Really great set of saucepans This a fabulous set of saucepans. The handles of the saucepans stay cool, they feel wonderful under your hands, and are relatively easy to clean - stubborn bits come off pretty easily after you soak them. Look good as new with a microfibre cloth, some water and the essteele stainless steel cleaner. If you don't want to scratch the insides use wooden or silicone implements but of course they will still work just fine if you scratch them, as they are stainless steel. Haven't used trhe steamer yet though.